First Batrep of 2013! 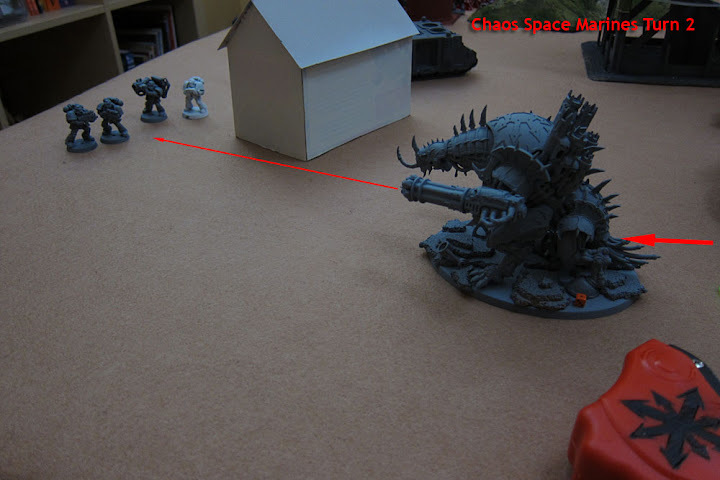 Blood Spectres v Chaos Space Marines! Turn 1 is mostly moving up. One of the Land Speeders scores a couple of good hits on the Forgefiend, taking 2 Hull Points off (leaving 1 Hull Point). 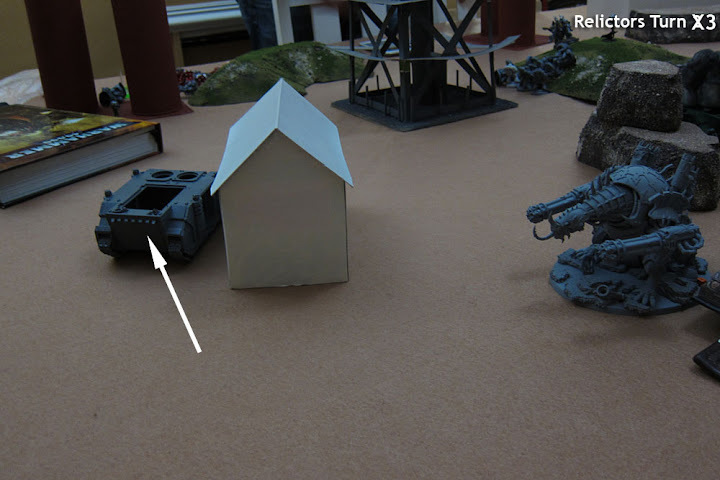 The Rhino is also able to take a single Hull Point off the green Plague Marine Rhino. 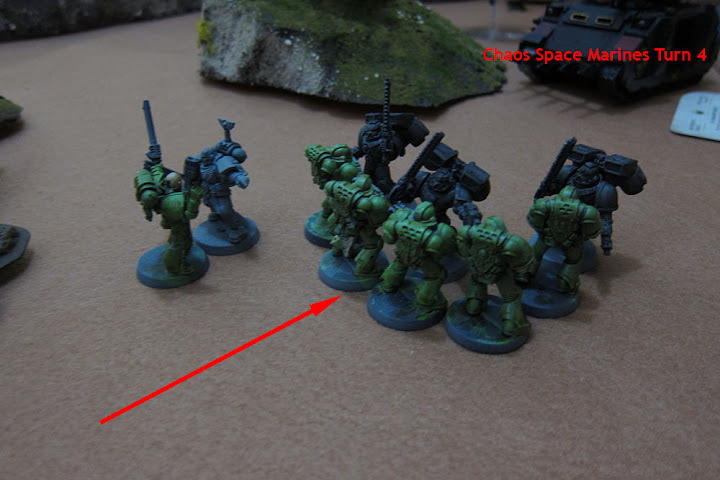 The Chaos Spawn move up – with no save, they have to stay well behind cover to make sure they reach the enemy. 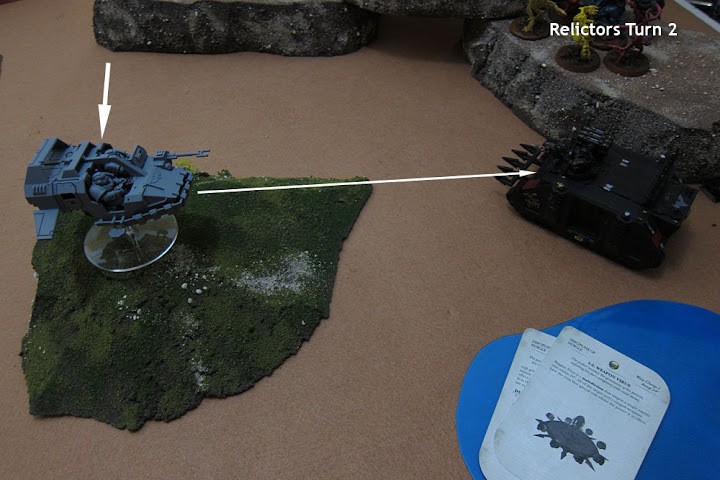 The Khorne Berzker Rhino takes aim at the Land Speeder, but doesn’t hit. 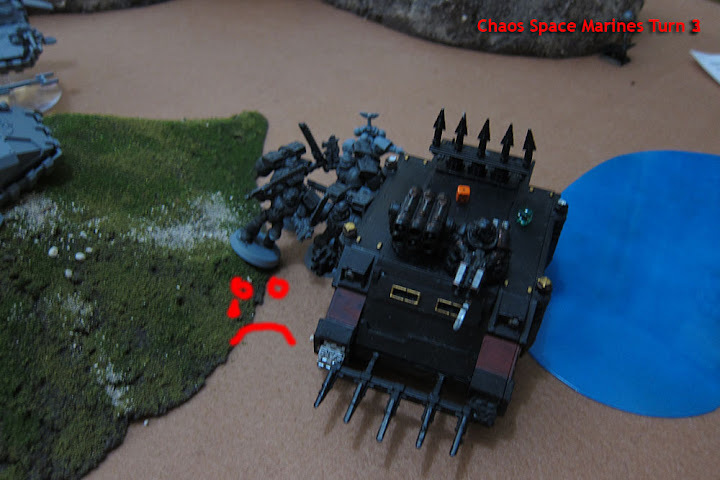 The Forgefiend is unable to penetrate the front of the Death Company Rhino, and the storm bolter on the Plague Marine Rhino misses the Land Speeder. 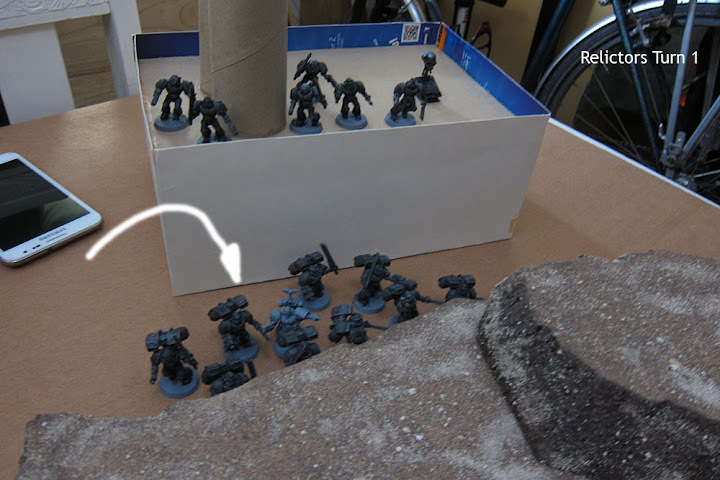 …and out pour some Death Company! 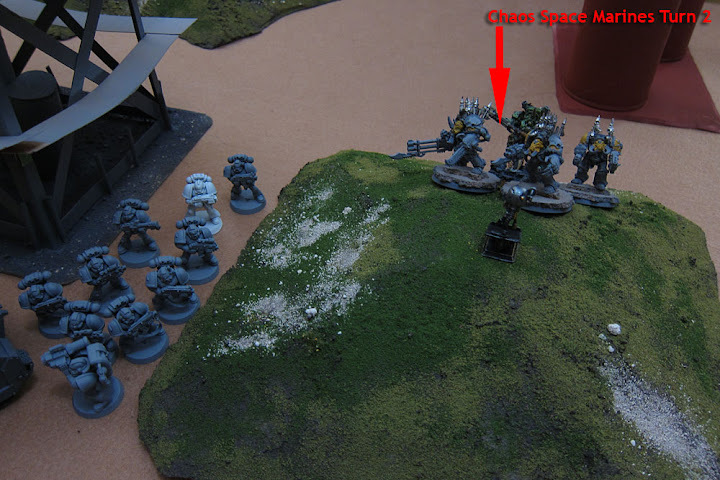 They fire on and assault the Havocs, who don’t get a single hit in Overwatch and are wiped out in one go. 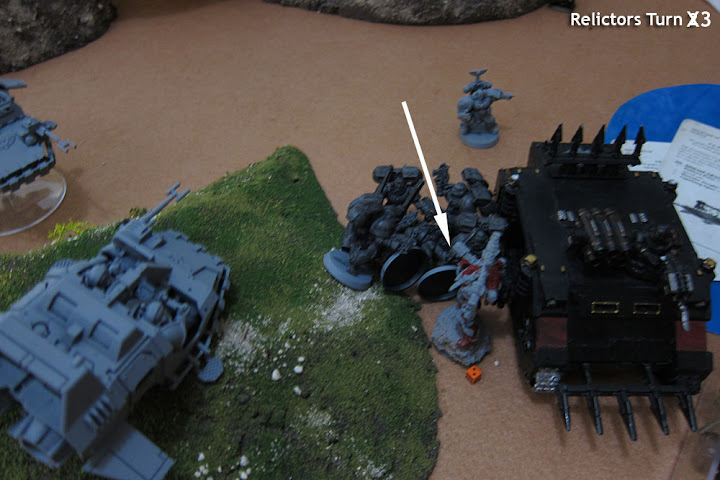 The Land Speeder turns and fires on the Khorne Rhino, and doesn’t manage to hit. 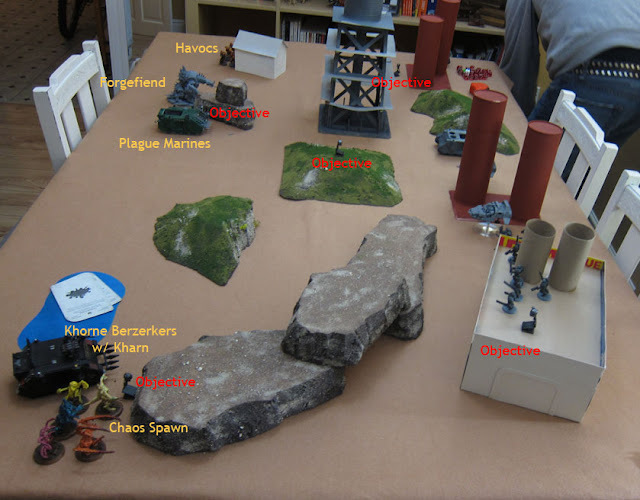 (not pictured) The Jump Death Company shoot at the Chaos Spawn, then do a Hammer of Wrath attack jump assault, killing all of the Spawn in one go. 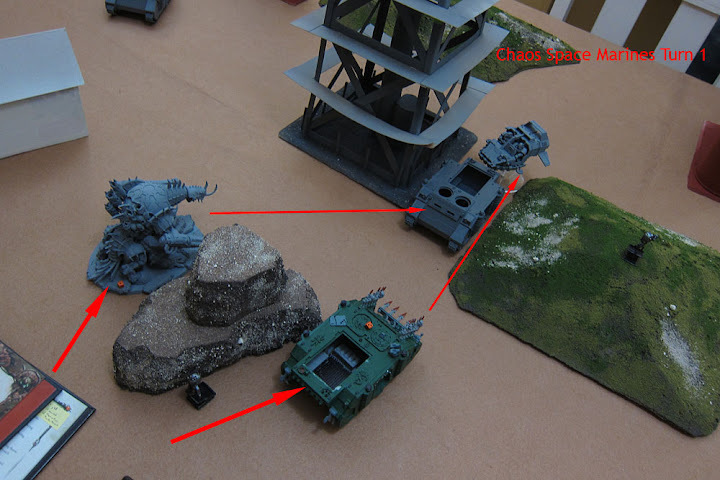 The other Land Speeder moves forward, fires on the side armor of the Plague Marine Rhino, wrecking it. The Plague Marines exit out the rear, out of the assault range of the Death Company that have disembarked from their Rhino. 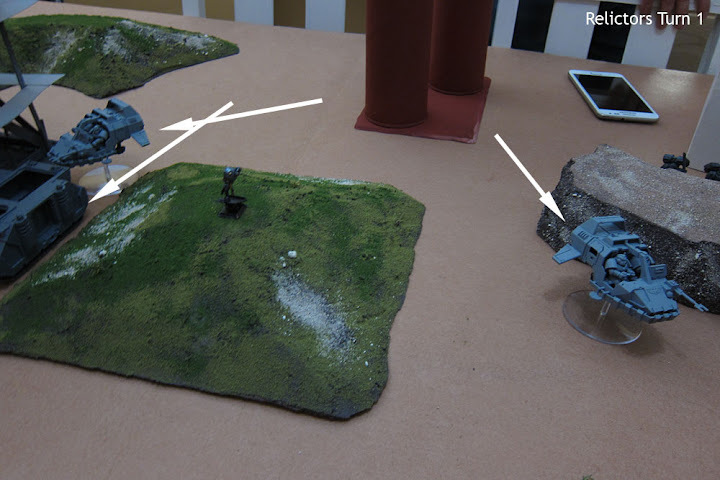 So they run back towards their deployment area! Typhus arrives with his Terminator bodyguard! 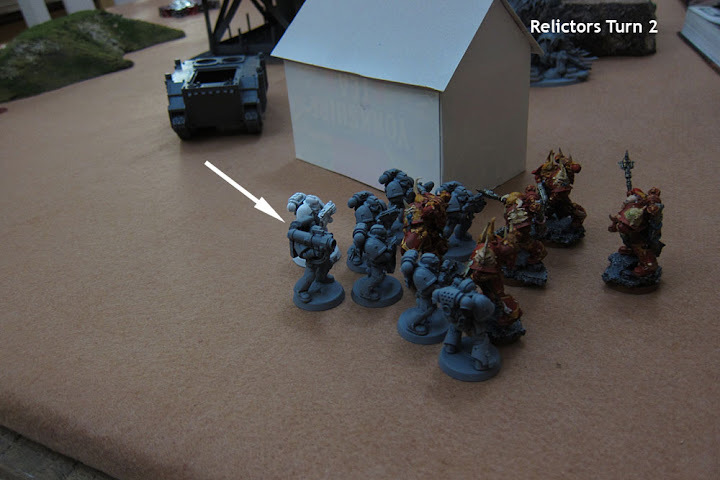 He attempts to cast Maledictions on the Devastators (they pass their Deny the Witch roll) and he fails his Psyker test on the Death Company in front of him. 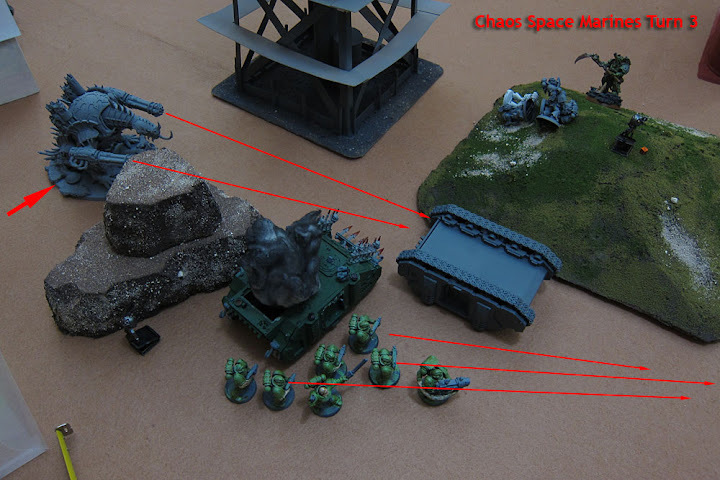 The Plague Marines fire a Plasma Pistol and Plasma Gun, taking a Hull Point off the other Land Speeder. 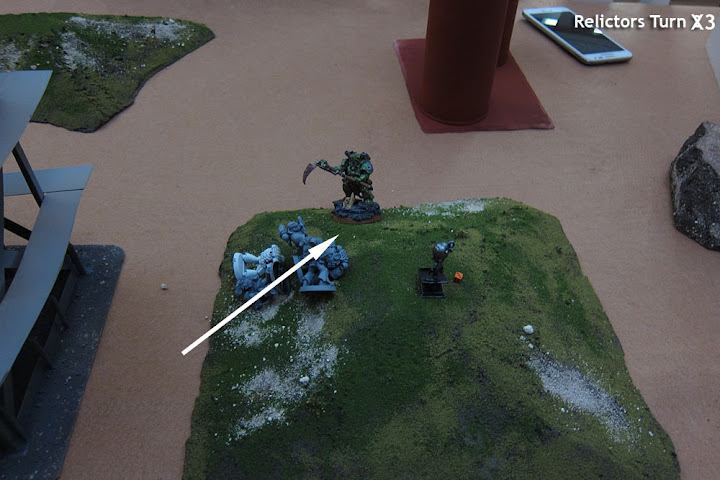 The Forgefiend turns and fires on the other Death Company, pulverizing five of them! 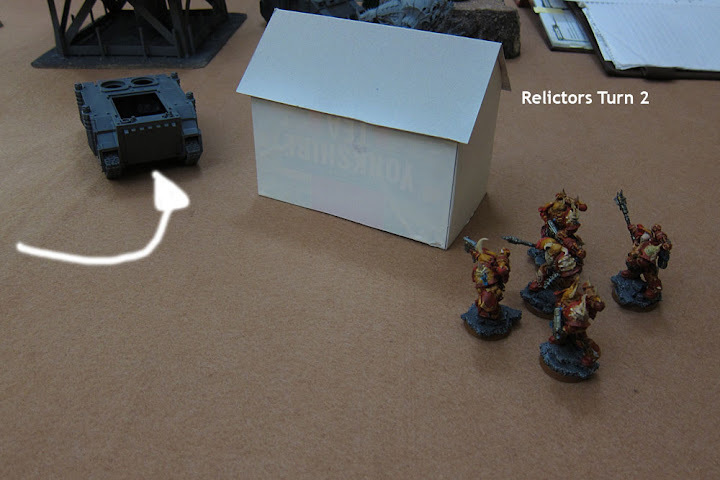 The Devastators take out two of the Chaos Terminators, and the Death Company on the central hill move up and fire on the remaining Terminator and Typhus. 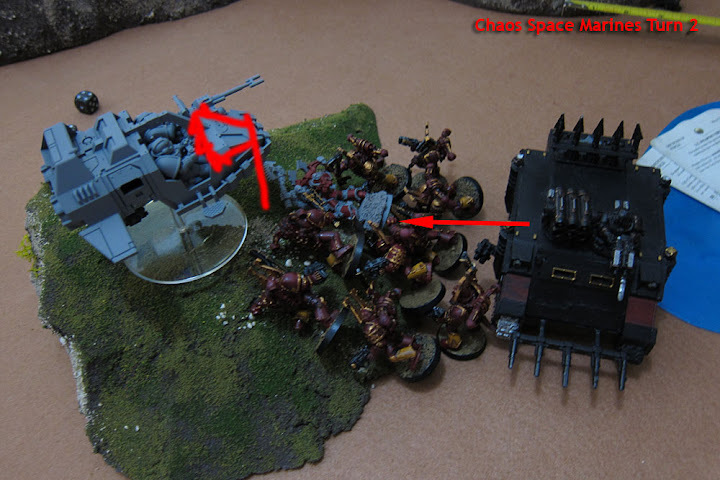 The Land Speeder sideslips and readies its weapons on the Khorne Berzerkers. 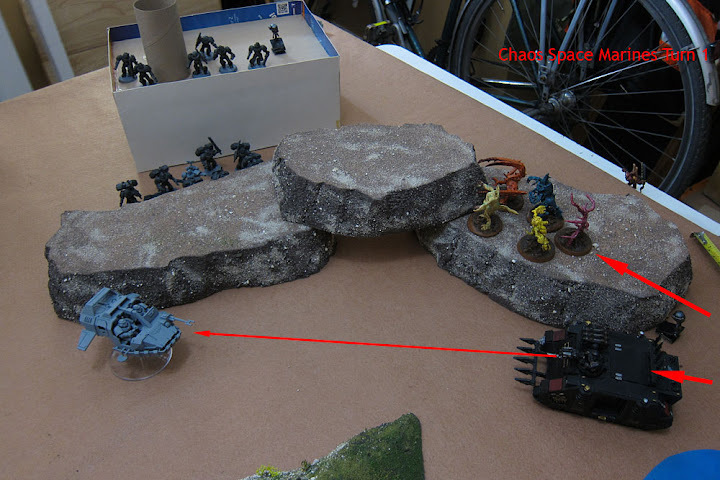 The Land Speeder and Jump Death Company move up and fire on the Khorne Berzerkers, taking out a couple of the brave Chaos fighters! 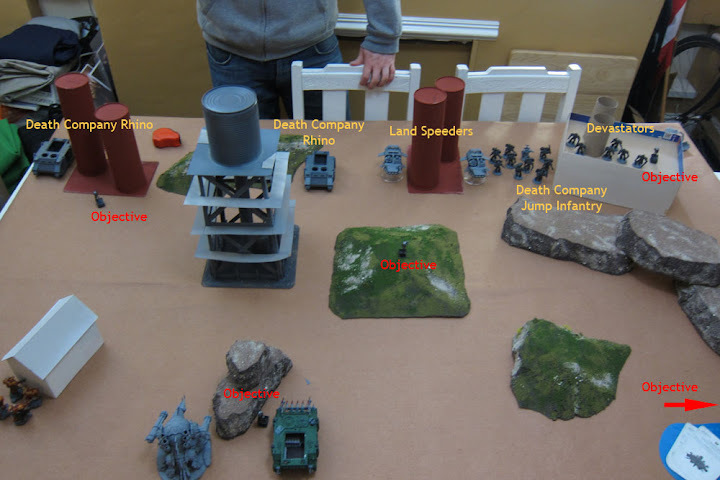 The Death Company at the other end of the battle embark on their Rhino once again! The Death Company charges Typhus, and he releases a devastating Nurgle-tastic cloud of death, killing four of the Death Company! 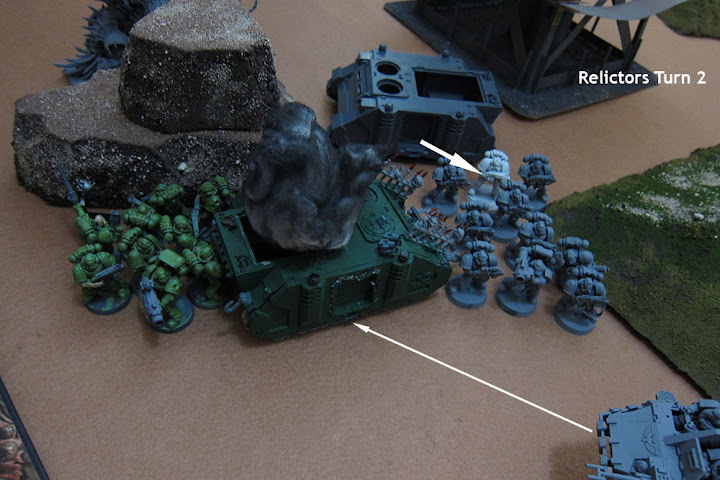 The remaining Death Company kill the final Chaos Terminator bodyguard and take one wound off Typhus. Kharn goes first, and he kills two of his own, while killing one of the Death Company! 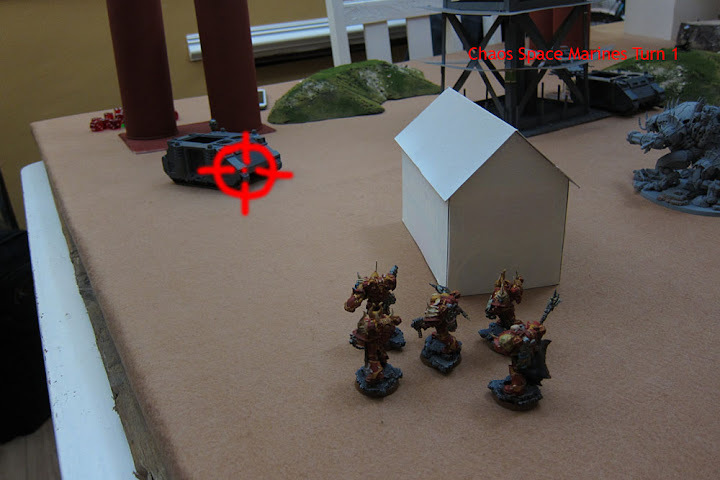 The Death Company respond by killing all the remaining Khorne Berzerkers, but the Berzerkers are able to take out a couple of the Death Company on their own. 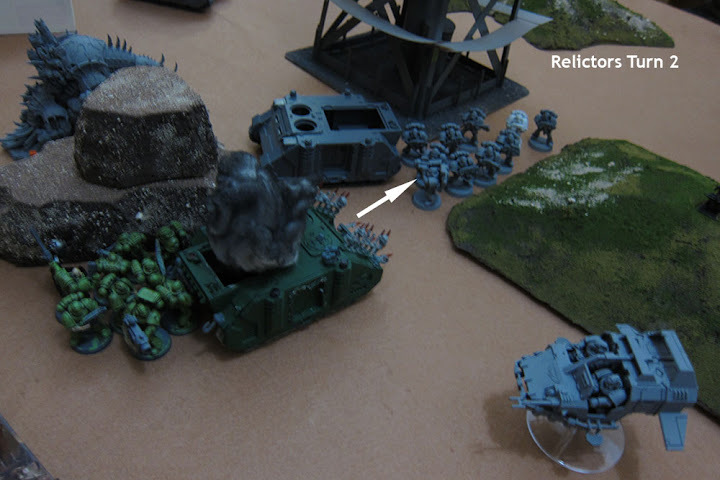 The Forgefiend moves forward and blasts the rear of the Relictor Rhino, exploding it – the blast envelops all of the Plague Marines and kills one! 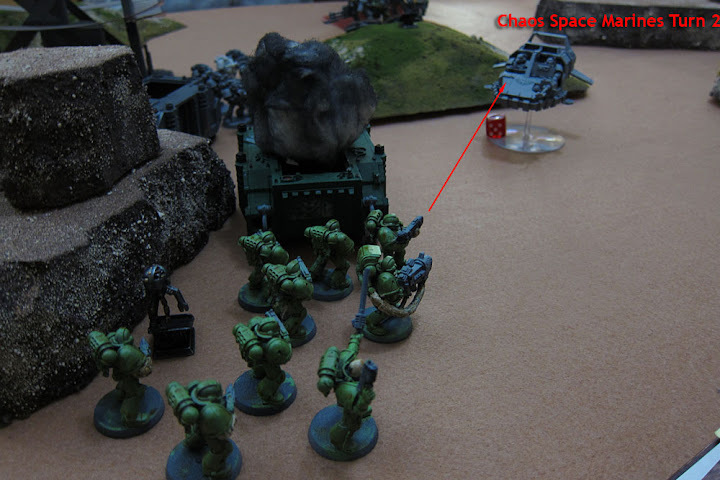 The remaining Plague Marines fire on the last surviving Land Speeder, but are unable to kill it. 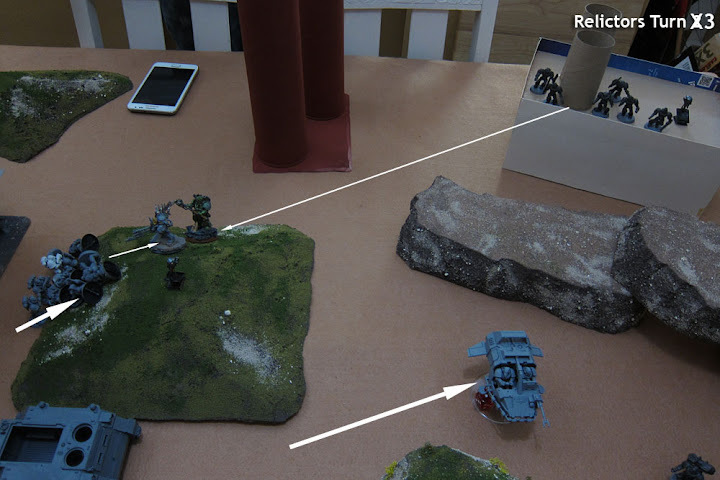 …but Kharn is killed by the Death Company! 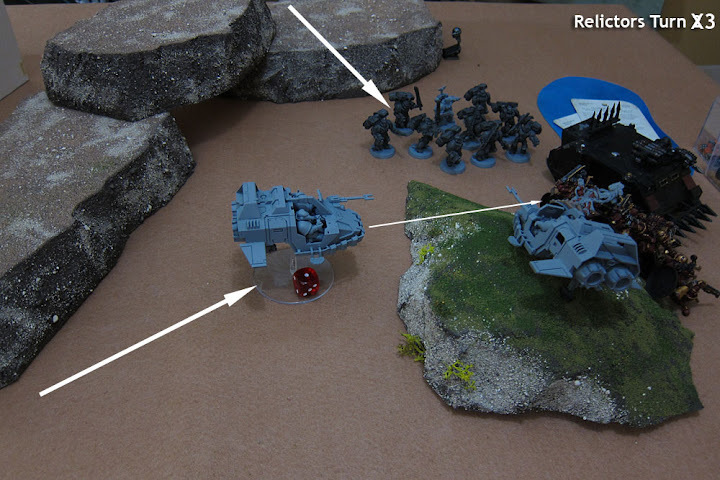 He is able to take out a few more Death Company, as well as a couple of hull points off the Chaos Rhino next to him. 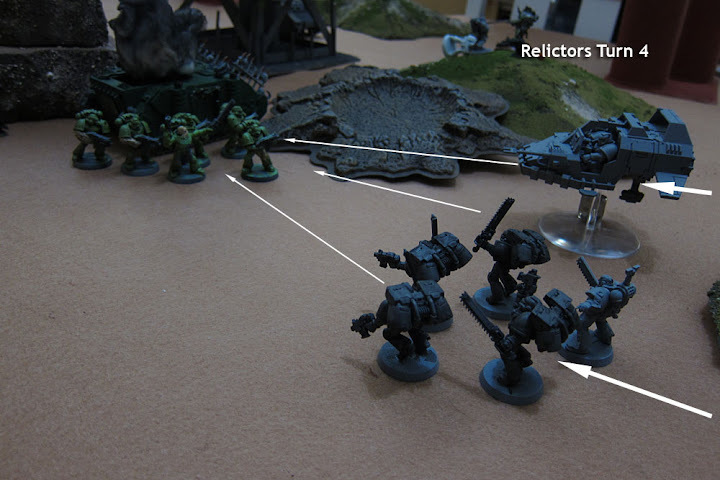 The Plague Marines are the last Chaos troops left on the map, and the last hope for the Relictors to get a victory. 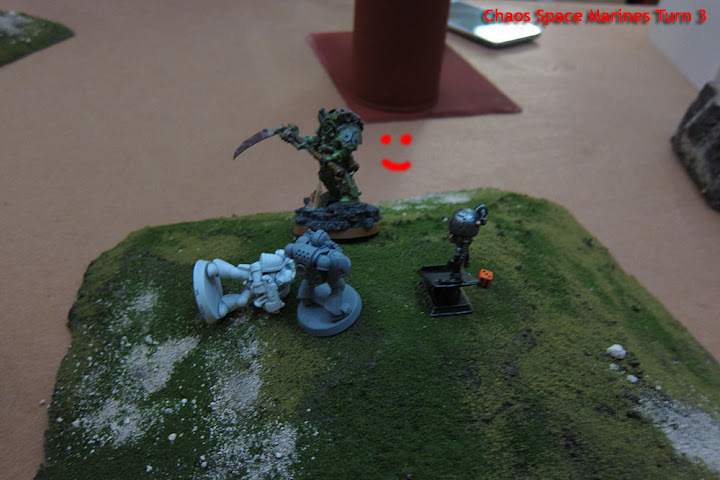 (not pictured) The Devastators kill the Forgefiend, and the close combat continues on the central hill! The Plague Marines charge the Death Company! With their poisoned Plague Knives they are able to kill one, and the Relicarch (Warlord) is the first Relictor leader to accept a challenge from a Chaos Champion! After another round of combat, the Plague Champion is killed and the leader of the Death Company on the hill is the last to fall. At this point we had to call the game for time. Technically a win for the Chaos Space Marines because of the Death Company troop choices, but roughly a draw with the forces on the field. Rules comment… Somewhere a squad charged out of a rhino… You can’t do that. And from memory, I don’t think you can charge the turn after your rhino is wrecked either. Kharn does make Berzerkers troops if he’s in the army, same as Typhus, yeah. So no assaulting. No I was just checking it was ok having both typhus and kharn unlock them as troops as you can only make one your warlord! Ah yes! They’re not assault vehicles, of course. Typhus was my warlord but I can’t remember if the rule is the character has to be warlord to unlock troops, or if he just needs to be an HQ choice. What do you think of the labels and arrow, etc? Do they make it easier to understand what happened? Cool, wanted to be sure it’s helpful and not cluttered.